Enter the EcoChic Design Award, the international sustainable fashion design competition organised by Redress that aims to inspire emerging fashion designers and students. The 10 finalists were recently announced, and will each be realising a six-piece sustainable collection over the next three months for the grand final during Hong Kong Fashion Week in September 2017. Read on to learn more about eight of these up and coming eco-designers and their style philosophies—they’re definitely ones to watch. Amanda Borgfors Mészàros is currently studying fashion design at the Beckmans College of Design in Stockholm, Sweden. 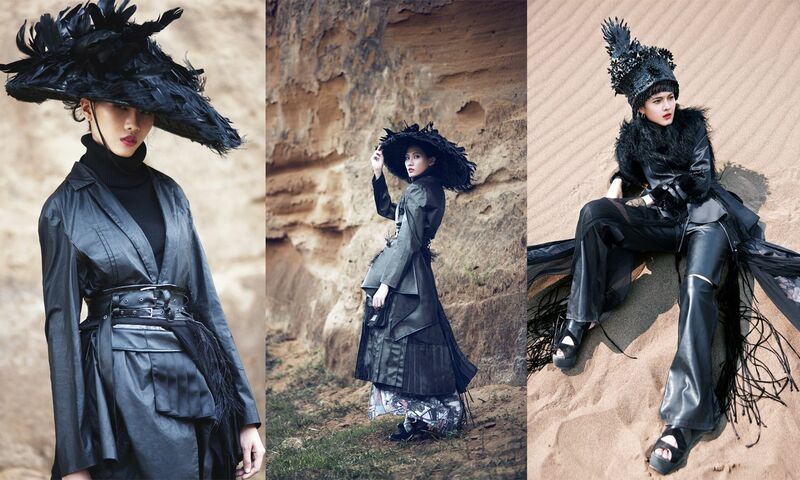 Her dramatic, sweeping silhouettes incorporate up-cycled damaged leather, which would otherwise be thrown away. Describe your designs in 3 words: Conscious, thoughtful and dynamic. Inspiration: The contrasts seen above and below the ocean surface. Eco-design techniques: Zero-waste, up-cycling industry surplus textiles, blending diverse fabric textures. Favourite brands: Aesthetically I am very attracted to Céline, Juun J and Ann Demeulemeester. Philosophically and sustainably I am drawn to brands such as Faustine Steinmetz, Chalayan and Lemaire. Hung Wei-Yu has a degree in fashion design from the Fu Jen Catholic University in Taiwan, and runs his own fashion brand alongside his role as chief brand officer for a cosmetics company. His moody and darkly glamorous designs draw on unique inspirations: a previous collection was based on the traditional clothing of the Black Hmong ethnic minority and on religious fanaticism. Describe your designs in 3 words: Tradition, avant-garde, handicraft. Inspiration: For this collection, I was inspired by Madama Butterfly, the transformation of Japanese culture from the western influences that came during WWII, and the Japanese Boro patchwork style. Eco-design techniques: I up-cycle and reconstruct wedding dress samples, secondhand kimonos and obi, as well as waste textiles. Favourite brands: I like Maison Margiela for the application of some sustainable fashion design techniques in their collections. I think they balance creativity and sustainable design very well. I also like Alexander McQueen for his creation of the fantasy world of fashion and imagination in his designs. Kate Morris studies fashion design at Nottingham Trent University in the United Kingdom. Her colourful, cheeky knitwear creates minimal seam silhouettes and uses end-of-line yarn which would otherwise be thrown away. Describe your designs in 3 words: Conscious, cruelty-free and cheerful. Inspiration: Our changing attitudes to food, and the bold patterns from pop art visuals of retro food adverts. Eco-design techniques: I blend technology with handcrafting and use reconstruction techniques to create diverse knitwear. Favourite brands: Stella McCartney, Issey Miyake, Missoni, Honest by, Reformation, Everlane and Matt & Nat. Sung Yi Hsuan, who currently works as a womenswear design assistant and holds a degree in Fashion Design from Taiwan's Shih Chien University, turns everyday objects like rubber bands and exercise booklets into unique statement pieces. Describe your designs in 3 words: Memory, connection and slow future. Inspiration: Juxtaposing discarded fast fashion items with the age-old technique of weaving. Eco-design techniques: I up-cycle and reconstruct damaged industry textiles and secondhand clothing waste. Favourite brands: Katie Jones, who applies one skill—crochet—to an extreme in her collections. I also like Walter Van Beirendonck’s work and Viktor & Rolf’s recent haute couture collections. Joëlle van de Pavert is a graduate from the ArtEZ University of the Arts in the Netherlands and currently works for a footwear retailer. She sources materials from designer stock sales and fabric storage warehouses, then up-cycles them in her structured designs. Describe your designs in 3 words: Relaxed-chic, deconstructed and quality. Inspiration: The multiple ways by which the same materials can be manipulated and transformed, creating the sense of a never-ending story. Eco-design techniques: Up-cycling and reconstruction from diverse materials. Favourite brands: The Row, Comme des Garçons, Stella McCartney and Maison Margiela. French-born Claire Dartigues is a fashion design graduate from Parsons School of Design, New York and works as a freelance fashion designer in the US. Her previous collections have re-worked fabrics from luxury French brands such as Louis Vuitton, Sonia Rykiel, and Chanel. Describe your designs in 3 words: Emotional, creative and sustainable. Inspiration: Polluted rivers, and connecting the two very different worlds of finance and blue-collar workers. Eco-design techniques: I add natural dyes to industry surplus clothing and textiles. Favourite brands: I love Schiaparelli and Christopher Kane for their creativity. I love Cos for the silhouette of their clothes. I love Stella McCartney for her fight for sustainability as well as her design aesthetic. Colombian Lina Mayorga is a graduate from the Parsons School of Design, and is currently developing her fashion brand while also working as a fashion and beauty blogger. She sources fabrics that are fully organic and vegan, colouring them with natural dyes. Describe your designs in 3 words: Elegant, eclectic and bold. Inspiration: The United Nations conference that I attended on the sustainable development goals for 2030. Eco-design techniques: I upcycle textile waste sourced from a textile recycling company and leftover fabrics from old projects. Favourite brands: Delpozo, Off-White,Viktor & Rolf, Givenchy and Ports 1961. Ayako Yoshida is currently studying fashion design at ESMOD Kyoto. Her previous works have incorporated up-cycled traditional Japanese materials. In the aboce look, for example, the dark fabric for the skirt and pocket on the jacket were taken from an old kimono. Describe your designs in 3 words: Mode, conceptual and material-mix. Inspiration: Tsukumogami, the obsolete tools which according to Japanese folklore acquire a spirit after many years, even if they are broken. Eco-design techniques: Reconstruction and up-cycling, to transform abandoned materials such as discarded tatami mats and old kimonos into beautiful pieces and give them a new lease on life. Read more about the EcoChic Design Award and the 10 finalists (including Candle Ray Torreverde and Sarah Devina Susanto, who do not have realised designs yet) on ecochicdesignaward.com.